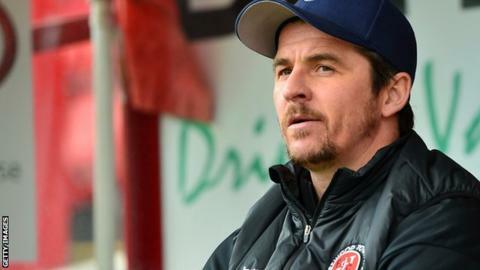 Barnsley have complained to the English Football League and Football Association following an alleged incident involving head coach Daniel Stendel and Fleetwood boss Joey Barton. The League One club said they are working with South Yorkshire Police and assisting with all enquiries. Barnsley player Cauley Woodrow wrote on Twitter that Barton, 36, "physically assaulted" Stendel in the tunnel after Saturday's loss at Oakwell. On Monday, South Yorkshire Police said they were continuing to investigate reports of an assault at Barnsley Football Club. "No arrests have been made at this time and enquiries remain ongoing," a statement added. Fleetwood said they had "been made aware of an alleged incident" and were "currently establishing the facts". BBC Radio Sheffield reported on Sunday that German Stendel, 45, was "OK" but "suffered facial injuries". Sky Sports News showed footage of Barton attempting to leave the ground after the match, but the car in which he was a passenger was stopped by police, before being allowed to proceed. Barton later rejoined the rest of his team for the journey back to Lancashire.